The DC power jack, located next to the 9 pin serial port connector is intended to be the main power input for the board. It's center pin is positive and the ring is negative. There is a diode connected to the input to protect against reverse polarity connection. The two pin connector next to the IDE ports is intended to allow the board to run from four AA size batteries. It can also accept a 5 volt power input. A three pin connector is located close to the left line-level audio output. This connector allows an alternate 12 volt input, which is connected directly to the main power jack. The IDE Disable pin, when pulled low, requests that the board's IDE interface place all of its IDE signals into a high impedence mode (tri-state). Note, currently (13 Sep 2000) this feature is not implemented by the firmware. The four pin connector near the right side of the SIMM socket is intended to allow a LCD display board to be connected. The transmit and receive are connected to the same UART as the serial port connector. The hard drive requires 5 volts and 12 volts from the external power supply. The 5 volts is also connected to the 2 pin connector on the board, and the board's supply generates the regulated power needed on the board. Patrick Fischer sent a photo of his board mounted in a black 42cm case that matches other stereo components, available from from Thel (German site). 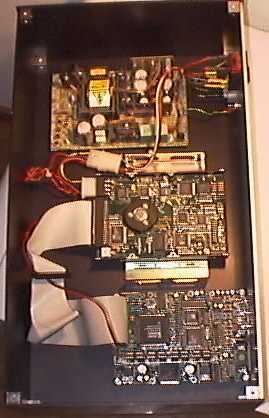 The power supply provides power directly to the standard size hard drive, and the +5 volt line and group run to the 4.5-6 volt input on the MP3 player board. This section only applied to board built from the partial kit without the power supply. The external power supply must generate the 5 volts and 12 volts for the drive, and it must provide 5 volts and 3.3 volts to the MP3 player board. The red line (+5 volts) is attached to the positive side of the large 2200 µF capacitor on the right side. The black wire (ground) is connected to the negative size of this capacitor. The orange wire (+3.3 volts) is connected to the positive side of either of the 330 µF capacitors directly above the large capacitor. The 12 volt DC power is connected to the DC input jack, or the three pin connector. The on-board power supply creates the regulated voltages for the board and the laptop hard drive. Warning: the current firmware (13 sep 2000) operates the drive continuously, and the pre-regulator can become hot. Please check the temperature of the transistor on the right side of the board, to make sure that is is cooling adaquetely. Future firmware will use DRAM buffering and never operate the drive in a high power mode for more than several seconds. The batteries are connected to the 2 pin connector. Four 1.2 volt NiCD or NiMH batteries should be used. Do not short the jumper in the upper right corner of the board. If 12 volts is applied to the board, it will supply the power instead of the batteries. Please use caution if you short the trickle-charge enable jumper in the upper right corner. This feature has not been tested with different batteries. MP3 Player, Power Source, Paul Stoffregen.